My friend Kim has the best line about Kentucky Fried Chicken changing their name to KFC to hide the fact that they fry the stuff: "YOU MOVED THE HEADSTONES BUT YOU DIDN'T MOVE THE BODIES!" she says. Heh, point to Kim. I do remember when Col. Sanders himself was in the ads, and they were downright weird. He was no actor, which is kind of awesome, but he was also really awkward. And he said each piece of chicken was dipped in "egg WARSH." Also notice how he kicks this girl off his lap. Why even start the commercial with her there? It's like an SNL skit. The one Kentucky Fried Chicken jingle I remember has some ballader kind of singing all wistful-like "Kentucky Fried Chicken, I'm taaaaaking you back hooooome. To make up for the time I've been awaaaaaaay...just sit around the table, with my friends and fa-mi-ly. Kentucky Fried Chicken, coming home feels goooood to me!" If anyone can find that one, please post the You Tube URL to prove I'm not insane. 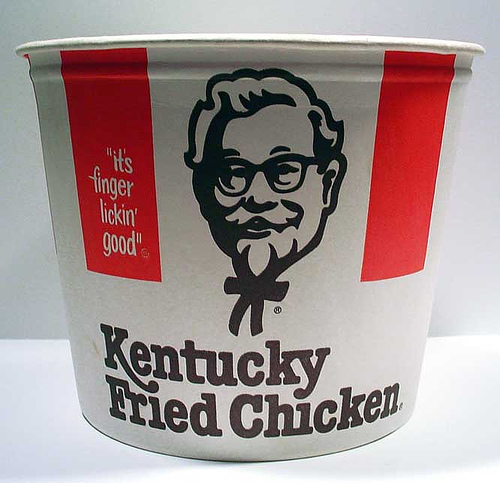 The re-naming of Kentucky Fried Chicken to KFC is part of the unfortunate trend toward companies whitewashing their old brands. Just like Sugar Pops became Corn Pops and Sugar Smacks became just Smacks. Often the renaming of a company or product makes sense... but these guys aren't fooling anybody! Is that the real Colonel or the Disney animatronic Colonel?